Deep underground, in a hostile uncharted dungeon, I set out from a shrine in search of lost townsfolk and mysterious treasures. After battling through several rooms full of monsters and obstacles, I discovered one of the missing townsfolk. Great! Now I was presented with a choice: trudge back to the shrine and save my game, or forge on ahead looking for the next shrine. I chose to journey forward, health and supplies dwindling, more desperate with each new room I entered. And then eventually… I died. Game over, progress lost. I was sent back to the shrine, to re-rescue the townsperson, and repeat my trek through a dozen more rooms beyond. This sort of crossroads is a recurring one in Chasm, a mostly-solid Metroidvania by studio Bit Kid, Inc. that’s often made frustrating by its procedurally generated map. Procgen can be an inelegant tool, and Chasm demonstrates that it may not be an appropriate one for a genre that benefits greatly from precise and skillful map design. The procedurally generated map introduces a level of inconsistency that throws the game off balance; difficulty seems to spike and drop randomly, and some of the most interesting systems take far too long to become rewarding. Chasm begins by introducing its protagonist as a young knight recruit. Your character is sent on their first mission, to investigate a call for help in a small mining town. But what should be a simple task spirals into an elaborate rescue mission and discoveries of a mysterious presence lurking in the depths beyond the mines. Throughout the game, the player will explore an ever-growing map that sprawls across various colorful zones and is loaded with a variety of enemies and obstacles. The game features some light RPG elements, with the player character gradually levelling up and improving a set of stats that determine combat proficiency. Stats can also be boosted with equipment that can be bought, crafted, or randomly dropped from enemies. The opening moments of the game are brief and punchy. Before long, a mystery is presented, and a dungeon opens up in which to find the answers. Chasm’s pixel art is lovingly crafted and really pulls its weight to keep the dungeons interesting from room to room. Music is nothing particularly amazing, but it has some strong moments and it fulfills its role of setting the tone for the game’s various dungeons. Sound is a little limited, and could have been deployed for greater effect in giving enemies more character and presence, but the sound effects that are there are punchy and satisfying. All-in-all, the game feels good on an artistic level. Though it can’t compare to games with handmade worlds like Ori and the Blind Forest or Hollow Knight, it makes an honest effort to ensure that its different areas don’t feel too stale even after hours spent in them. 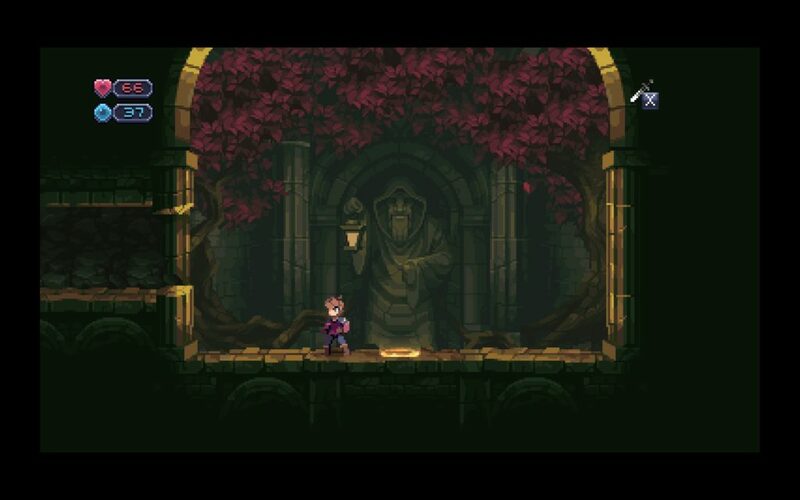 Movement feels very reminiscent of Castlevania: Symphony of the Night, which is undoubtedly one of Chasm’s major influences. Combat generally feels approachable but also leaves some room for skilled players to experiment a little bit, though it still stagnates after a while. Overall, it really is a pretty decent game… when the map lands in a way that works, and you have some luck in finding the right way through. The mechanical guts of Chasm aren’t incredible, but they’re good. They’re sturdy and classic and rewarding, and they’re bundled with RPG mechanics that create a couple of worthwhile vectors for customization. But that’s not enough by itself. 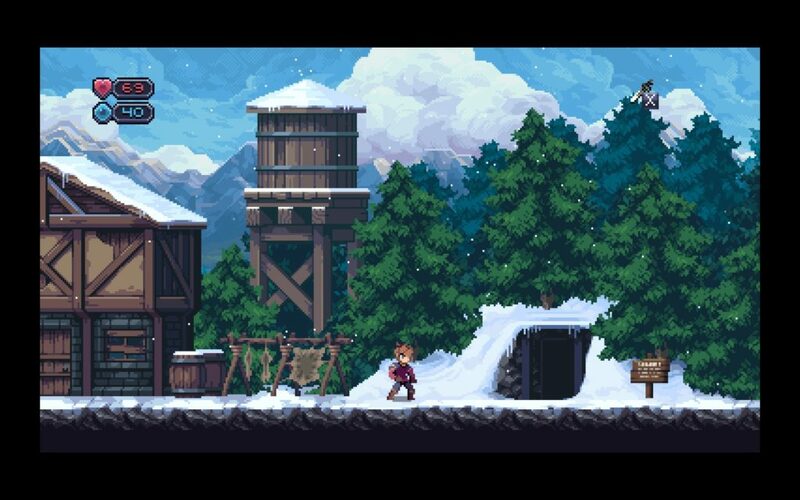 Chasm is structured as a Metroidvania: it’s exploration-driven and it gradually grants the player a series of abilities that increase exploration potential and allow access to previously unreachable areas. Metroidvania map and game design is a fascinating topic, and it’s often discussed in terms of a sequence of progression around which to build (for example, here). So it’s not unreasonable to see a studio attempt to distill these design philosophies into a procgen algorithm, in which basic rules are followed but details are filled in at random. And maybe that’s the reason that Discord Games decided to use a procgen approach to building the world of Chasm. 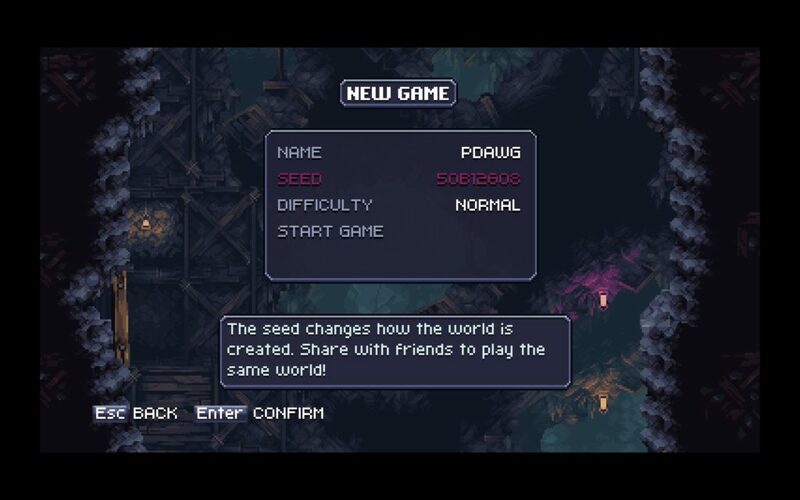 But the difference between a passable Metroidvania and a truly memorable one is the small touches: little details that guide players towards points of interest, tantalizingly inaccessible corners of a map that are oh-so-gratifying when they’re finally reachable and lead to meaningful discoveries. Chasm loses this designer’s touch in it’s procedural generation, which undermines the overall quality of its mechanics. Sometimes, exploring a newly accessible route resulted in an exciting new item or NPC, but often it was simply a chest with some weapon that was already obsolete. Rooms of interest that should be built up to (like mini-boss rooms or new abilities) sometimes seemed to just randomly show up. Chasm wasn’t able to manage my anticipation and expectations as I moved from room to room, and it makes the experience unpredictable and unsatisfying. I have some other minor gripes as well. None of the controls are explained, so some actions need to be discovered via the menu or experimentation. In some areas, the game does a poor job of differentiating platforms in the foreground from the background. These are small things, but on top of the inconsistency of the procgen, can make already-frustrating moments more frustrating. Don’t get me wrong; I think there’s plenty to like about this game. I enjoyed the way that rescued NPCs open up shops and enable access to new systems like magical weapons, upgrades, or crafting. There’s a nice variety of magical weapon attacks that provide interesting utility against tough enemies. There were even a few pieces of equipment with odd effects that surprised and delighted me. Many of these systems don’t reveal themselves until several hours in, but I did find them genuinely engaging once I made enough headway. Backtracking to older areas to get past barriers is, at it’s best, just as gratifying as it is in other modern Metroidvanias. I think that if you’ve got some podcasts queued up to listen to during your dungeon exploration, this game may still manage to provide a pretty solid experience. 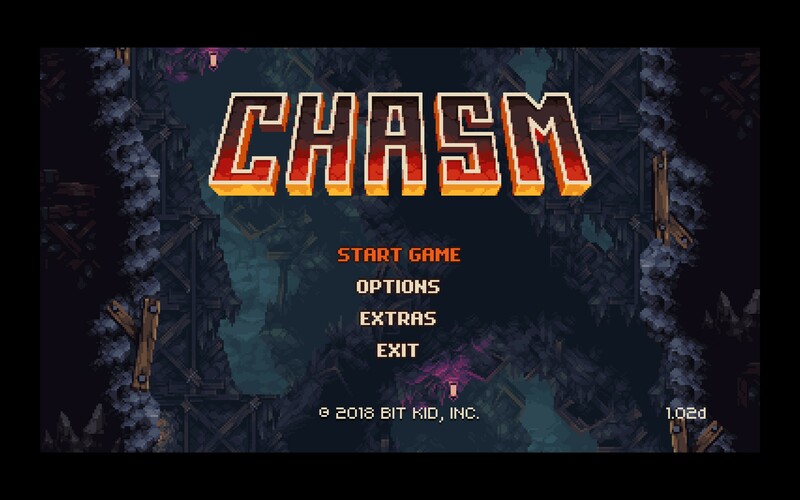 I wish it hadn’t felt the need to be constructed on top of a procgen algorithm, because a well-made, handcrafted version of Chasm would likely have been a solid 8 out of 10. The town is where rescued NPCs gather and provide their services. Ultimately, however, it lands more in the 6 out of 10 range. And that’s not bad! But it can be tough to justify the 10-15 hour investment when there are so many incredible Metroidvanias available, some of which are expansive and deep like Hollow Knight (if you didn’t notice, I really like Hollow Knight), and some of which are short and sweet like Xeodrifter. And with the way this month is shaping up (with two more big Metroidvanias launching and one leaving early access), I don’t foresee Chasm being at the top of my roundup.